Acorn Cottage01263 715779work01603 870304fax Self-cateringSet within a peaceful spot just on the fringes of Briston, Acorn Cottage is all on one level and makes the perfect base for a couple retreat. There is an open plan living area, double bedroom and an en suite shower room. Take morning coffee or enjoy a chapter or two out on the owners lawn where there is a picnic bench and companion table and chairs. Relax, unwind and enjoy getting out into open countryside, be it a walk or a cycle ride - there are plenty of quiet country lanes and signposted tracks to follow nearby. A short stroll into the village will take you to the Butchers, Bakers, Co-Op, general store and The Explorers cafe/pub. Holt, a Georgian town with boutique shops, eateries, a department store, art galleries and a independent supermarket, is just a few miles away and the diverse North Norfolk coastline is within easy reach. Take a stroll through the woods and out onto the vast open sandy beach at Holkham, enjoy an evening meal at one of the many good pubs or restaurants that are dotted along the coast, watch the sun set from Cromer pier, it is a lovely area to explore together! • Other: Towels. Books and Games. DAB Radio. WiFi. 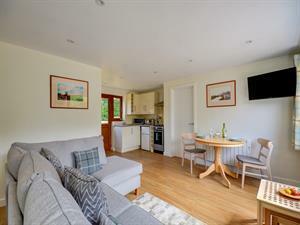 Set within a peaceful spot just on the fringes of Briston, Acorn Cottage is all on one level and makes the perfect base for a couple retreat. There is an open plan living area, double bedroom and an en suite shower room. Take morning coffee or enjoy a chapter or two out on the owners lawn where there is a picnic bench and companion table and chairs. Relax, unwind and enjoy getting out into open countryside, be it a walk or a cycle ride - there are plenty of quiet country lanes and signposted tracks to follow nearby. A short stroll into the village will take you to the Butchers, Bakers, Co-Op, general store and The Explorers cafe/pub. Holt, a Georgian town with boutique shops, eateries, a department store, art galleries and a independent supermarket, is just a few miles away and the diverse North Norfolk coastline is within easy reach. Take a stroll through the woods and out onto the vast open sandy beach at Holkham, enjoy an evening meal at one of the many good pubs or restaurants that are dotted along the coast, watch the sun set from Cromer pier, it is a lovely area to explore together!